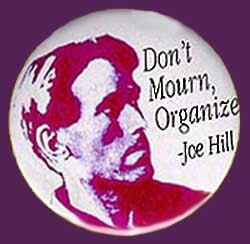 Joe Hill button. Joe Hill (Joseph Hillstrom) was a legendary figure in the Industrial Workers of the World (IWW) -- an organizer and songwriter, executed on a murder change by the state of Utah in 1915 despite a worldwide campaign to save his life. The button's message is a variation of what Hill is supposed to have said before he was killed: "Don't Mourn for Me--Organize!" Hill is also the subject of one of the more famous labor songs, written by Earl Robinson with lyrics by Alfred Hayes. Anyone who knows the circumstances of this button's issuance is requested to contact us at Labor Arts.